In the decade prior to 1903 when Andrew Carnegie erected his palatial mansion at 5th Avenue and 91st Street, the area which would become known as Carnegie Hill was being developed with homes for the middle-class. As the city became more and more congested, families moved northward to the comfortable homes being built in the 80s and 90s. 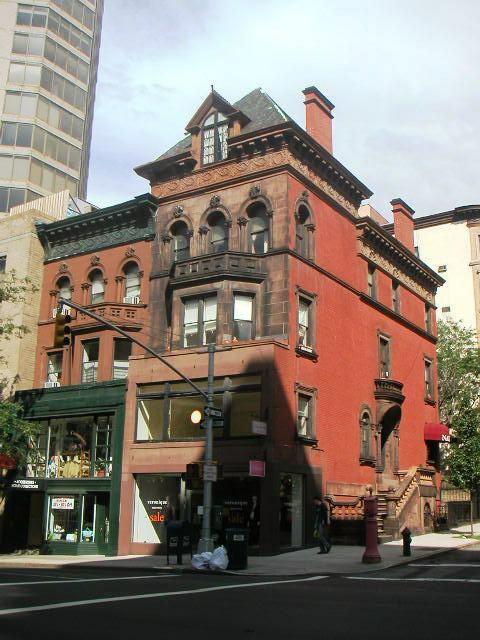 In 1890 real estate developer James Woolley began construction on two sets of five rowhouses from 91st Street to 93rd Street on Madison Avenue. Designed by architect James E. Ware, the homes reflected the fashionable Queen Ann style of the period. Projecting bays, eccentric angles and a variety of architectural elements combined to make Ware’s residences up-to-date and alluring to buyers. By 1891 when the project was completed, most of the homes had already been purchased. Among them, the key corner property at 1321 Madison Avenue was remarkable. Fronted with brownstone, it featured a triple-sided bay on the third floor, topped by a stone paneled bulwark. Four arched windows wrapped the front of the fourth floor, with one facing 93rd Street. An impressive pyramidal roof with a large, attractive dormer created a visual impression of a corner tower. Below the bracketed cornice a pressed metal frieze of swags and scallops ran the length of the building. The entranceway on 93st Street, however, was the most impressive element. A high brownstone stoop rose sideways to the home, with heavy carved newels and squat balusters, atop to. 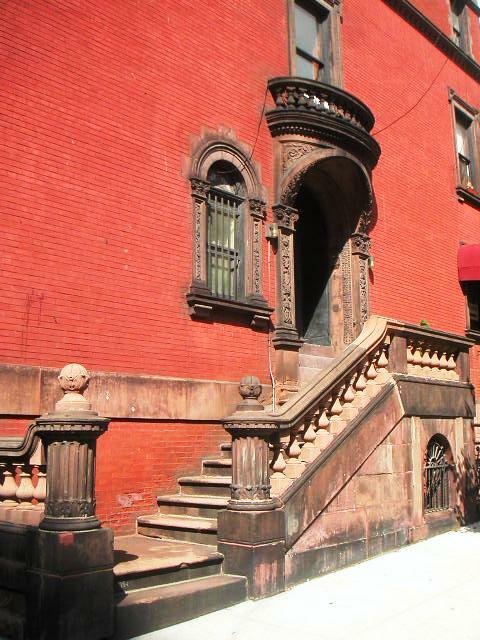 A deep, carved brownstone hood sheltered the imposing, recessed arched doorway, over which was a matching balustrade. Beside the entrance an arched window mimicked the shape of the doorway, flanked by miniature versions of the elaborately embellished pilasters that upheld the entrance hood. 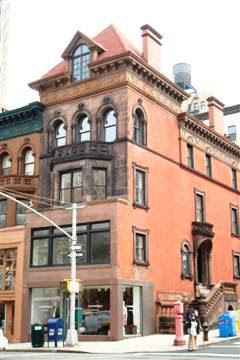 The roomy house at 1321 Madison was home to a succession of families before the change in the Madison Avenue neighborhood from residential to commercial. One by one the houses in James Woolley’s two rows were demolished to make way for modern retail establishments until today only No. 1321 and its next door neighbor survive – with substantial alteration to the first two floors. Despite the renovations, the charm of James Ware’s corner house remains evident today. With only a little imagination one can envision an 1890s mother hurrying her children up the outside stairs, finally home again. No. 1321 Madison Avenue was designated a New York City Landmark on July 23, 1974.